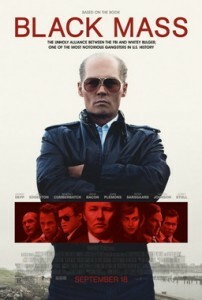 Black Mass tells the true story of notorious Boston crime kingpin James ‘Whitey’ Bulger (Johnny Depp) and how, through a relationship with childhood friend and now FBI agent John Connolly (Joel Edgerton), he expanded his criminal empire through his work as an informant for the FBI. When done well, gangster movies work on an operatic level unique to almost all mainstream culture. They attempt to glean insight into questions of morality and human nature from the stories of those willing to live outside the law and do terrible things to build criminal empires. Black Mass will not be remembered as a great gangster movie. The film fundamentally fails at turning Whitey Bulger into anything other than a killer who is remorseless, humourless and devoid of any emotion other than constant rage. That such a portrayal is apparently accurate is not an excuse; this is a drama, not a documentary. The only character arc James ‘Whitey’ Bulger has is turning from small time cartoon crook into full-on cartoon supervillain. There are moments, the death of Bulger’s son most of all, that are obviously inserted in order to humanise the character but they feel about as real as the Boston accents everyone in this movie is affecting. The sad thing is that there is a much more interesting film to be made about Whitey Bulger. His links with the IRA come up in Black Mass but they feel out of character for someone who up to that point in the film appears to have no interests other than beating to death anyone who looks at him funny. The story of the Irish in Boston feels underdeveloped as does the character of FBI agent John Connolly, whose allegiance shifts so swiftly to Whitey Bulger that the total lack of confliction leaves the character feeling one-dimensional. It should be said that underneath all the make-up Johnny Depp gives a totally fine performance as Bulger. He seethes the appropriate amount and convinces as a violent psychopath willing to kill anyone who gets in his way. Unfortunately that type of character has a limited capability in carrying a two hour movie and the supporting actors are not given enough material to turn their characters into anything overly compelling. With such rich source material, Black Mass should have been a better film. Overall I would give this movie 2 stars.